Have the color guard in the back of the room, ready holding the flags. The US Flag is on the right, then State flag (if used), then Pack flag on the left as the color guard is facing towards the front of the room – or, US Flag in front, followed by State, then Troop flag. Flags never touch the ground and are not played with. Scouts show respect by taking their roles seriously and not goofing off. The predetermined Scout walks to the front of the room and face audience. Scout: “Will the Audience please rise? 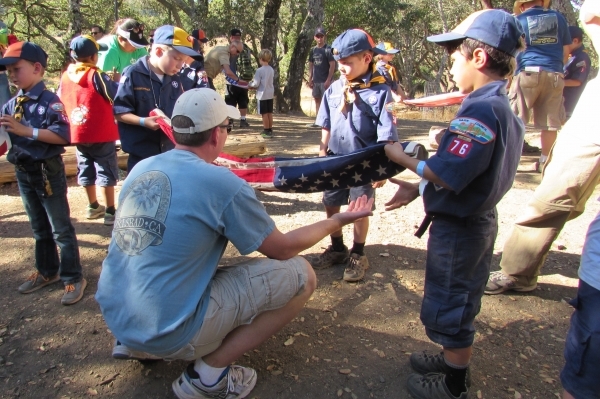 Scouts carry the US & Pack flags walking double file. US Flag crosses in front of other flags to left-most flag stand (as viewed from the audience), then State flag advances, then Pack flag on the opposite side. Wait for flag bearers to move to the flag pole stands. Scouts and color guard return to their seats. Include two other dens by letting having one from one den lead the Cub Scout Oath and another lead the Cub Scout Law. Notes: A Den Leader can fill in if no boy is comfortable leading the ceremony.